The mission of the NC-APE-AC is to promote quality APE services and equal access across the continuum of services for students with disabilities in North Carolina. 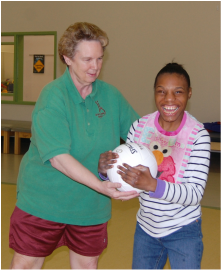 The vision of the NC-APE-AC is that individuals with disabilities develop the skills necessary to remain physically active and pursue meaningful lifetime leisure and recreation in their communities. ﻿The council seeks to accomplish this by increasing the number of highly qualified professionals in the field of physical education through certification in Adapted Physical Education, strategic staff development and collaborative efforts with interdisciplinary team members. In March of 2010, a group of concerns Adapted Physical Educators met at NC Central University to discuss a variety of topics. The North Carolina Adapted Physical Education Advisory Council (NC-APE-AC) was created during this meeting. Laurie Ray was appointed to be the DPI Liaison in September 2010. 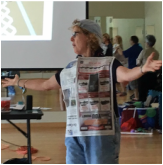 Since this time, the NC-APE-AC has presented at numerous conferences, universities, and institutes, created and submitted guidance documents to DPI, maintained the Adapted PE Corner in the bi-monthly publication - GREAT Activities, and become the primary resource for all things APE in NC. Interested in Adapted Physical Education professional development opportunities for your school system, region, and/or upcoming conference(s)? ​We can help! View the Adapted PE Professional Development Host Responsibilities to get started! SHAPE America's National Teacher of the Year award winners represent the "best of the best" in adapted physical education, dance education, health education, and physical education. We're proud of you, Lara! Help us keep this list updated! If you are aware of any Adapted PE job postings, let us know and we'll be sure to post it here! Email us at NCAPEAC@gmail.com with details. Become a Certified Adapted Physical Educator today! 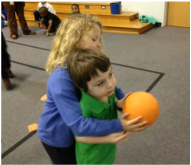 The goal of APENS is to promote a nationally Certified Adapted Physical Educator (CAPE). Click here for more information! Learn how to address different learning styles, and how to become a better and more successful educator/trainer. Visit the website for a list of upcoming workshops. ​APE 101﻿​ - Start Here! A big THANK YOU to the following sponsors for their continued support of APE in NC! US Games has donated over $1,000 of equipment to the NC-APE-AC to be used at presentations and conferences throughout NC! Visit their online catalog for specially designed equipment and useful resources! Sportime continues to be an essential part of the NC-APE-AC's efforts to spread the love of APE throughout NC. Check out their Abilitations catalog for equipment specifically design for students with special needs! 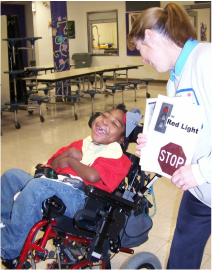 Click here to view the "APE for Students with Disabilities in NC" brochure. For council member information, including contacts by regions and topics, visit our Contact Page. This page will be updated as needed. Please check back frequently!